I like to watch movies to escape, to take my mind off of the stress and struggle, off of the sorrow in the world and the kind of pain that pools by our toes or is hurled down in glass-shattering balls of hail. Either way, when I push play on my DVD player, I’m looking for something entertaining, something inspiring, dare I say, happy. Now, it’s kind of ironic because often I’m drawn to the dark, heavy dramas filled with the suffering of human existence, made up of characters dealing with addiction or illness, unhappiness or betrayal. I blame being a therapist on that. We therapists are sometimes a twisted bunch, finding meaning and value by seeping ourselves in other’s pain. It’s interesting to me. I want to understand, to cure, make it all better with a cartoon colored band-aid. It’s true of the books I read as well. The other day a friend of mine was asking for some book recommendations, and as I took a deep breath, ready to rattle off a list of dozens for her, she added, “But nothing too heavy. When I read, I like to read uplifting, happy stuff.” I exhaled. Humm…I’ll have to get back to you. If I had to wager a guess, I’d say that there’s a reason they call therapists ‘wounded healers’. And by engrossing myself in the darkness of the world, it both makes me feel less alone and puts things in perspective. Rather than analyze this to death and hence kill the joy of reading, we’ll put this aside for another day. So, while I often enjoy the more morose, some would say ‘depressing’ movies, there’s a limit. I like a good drama where there’s tears and intensity, but I need some redeeming factor. We’re back to longing for happy endings. Give me the darkness but you have to offer at least a hint of light…come on, this is supposed to be entertainment! Right from the start, I love Robert DeNiro as dad. He’s sort of an older version of Steve Martin in ‘Father of the Bride’. The kind of dad that worries about seatbelts and waits by the phone for his kids to call. Ok, a tad worrisome that as I describe him, he sounds rather pathetic, but work with me – you know, the movie dad that loves his kids more than anything, would choose to be with them over anyone else, and lives to hear them say ‘I love you’. Can’t vouch for his quality of life, and as a therapist, I’m sure I’d have plenty to say to him about establishing boundaries and allowing his kids to live their own lives, but as a movie watcher, I’m rooting for him. And then, none of his kids come to visit, don’t make time with him when he travels across the country by bus to see them, and pretend that their lives are perfect as they each go through their own mid-life crises. Still, I don’t turn the movie off. I’m sure that there’s going to be some redeeming event – some happy ending, even if it’s cheesy and predictable. I look at my watch, aware that they better hurry up and go visit sad old dad because they’ve got 15 minutes before the ending credits. So I wait and I watch, silently cursing these four kids for not putting aside their own lives to give their father some joy. And then it ends…the happy ending? The son David that DeNiro couldn’t get in touch with? Yup, he died. Robert DeNiro – heart attack. Not really my idea of a feel-good movie. Sure, there was a token closing scene where the three kids come home for Christmas and they take a new family picture, but still, I was not pleased. And believing that the world is well managed, of course this exact topic had come up earlier in the day. My opinion had been that it’s a child’s job to give her parents joy; to convince them that they did a good job; to shower them with love, respect, and praise as a kind of repayment for all the sacrifices parents make on a daily basis. The counter argument was that we are all grown-ups, and at the end of the day, each person is in charge of their happiness. Her view was that it’s time to stop dancing around, attempting to be mind readers, trying to please each other; it’s time to speak your truth, while in a kind way, and ask for what you need; to set boundaries and limits with love. It makes sense, sure. Very wise, this counter argument possessor is. However, I tend to have a terminally unique worldview. Her ideas may be good for the general population, but for me, for my family, it’s not really applicable. 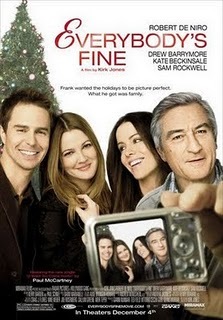 Two hours after this discussion/argument, I’m watching a movie of a family in which all of the members want to protect each other from worry, want to avoid disappointing their father, desperately trying to convince each other that ‘everybody’s fine’. The truth: no one was fine. And in the midst of all of this ‘un-fineness’ they stood alone because they couldn’t share their pain and still be ‘fine’. It wasn’t the darkness in their lives that was so heartbreaking to me. It was the isolation. The longing that they all had to be a family and get support and feel connected was so apparent and yet their old family script of being ‘fine’ got in the way. So, while it had personal meaning for me, it’s still not getting any more than one star from me. I am holding out for the happy ending. However, I will concede to the universe that I get the message. Stop caretaking, stop mind-reading (badly), stop shellacking the truth to make it more palatable. Stop being ‘fine’ because not only is fine boring, but we all have heard that fine really means ‘f-cked up, insecure, neurotic and emotional’. Note to self – stop being fine. And choose a romantic comedy tonight – preferably one that ends with happily ever after.